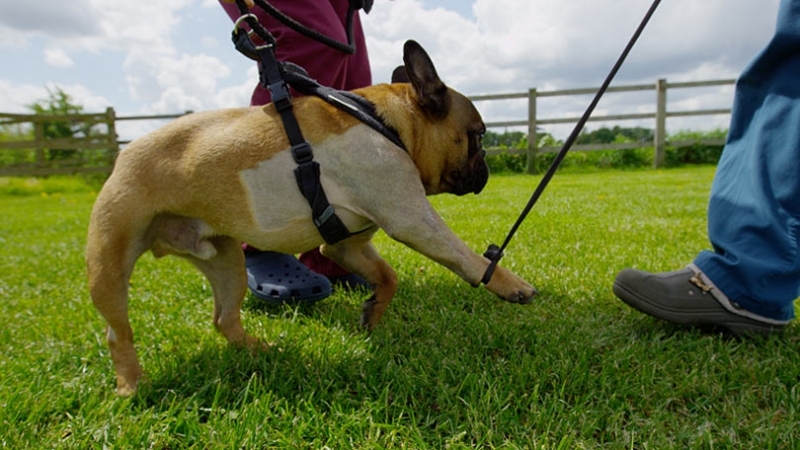 Bacus is a beautiful French Bulldog – he may be small but what he lacks in stature he makes up for in personality and he certainly has a big personality! It was clear that Bacus was in significant pain when he visited the clinic; he was limping heavily on his right front leg and was really struggling to move around. 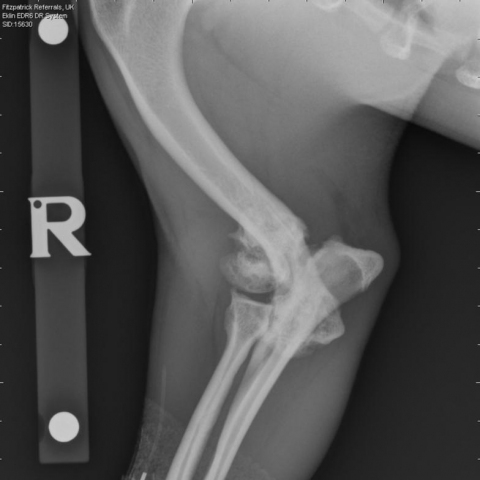 After suffering a serious fracture of his right elbow when he was a young dog and the bones did not heal in the correct orientation. This is described as a mal-union, and because the complex geometry of the elbow joint was distorted, it meant Bacus was unable to flex and extend without significant discomfort. 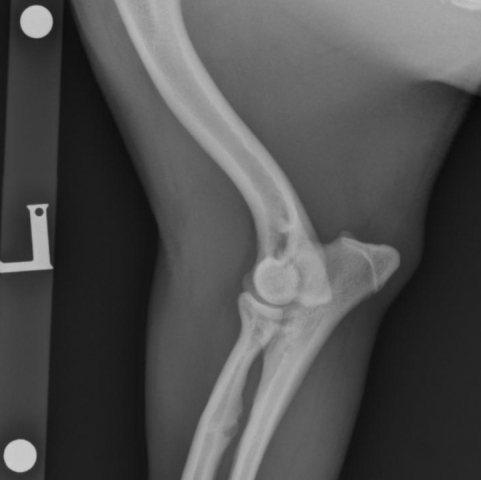 We first explored the possibility of re-fracturing Bacus’s elbow joint and reconstructing the joint to try and return normal function to Bacus’s elbow. 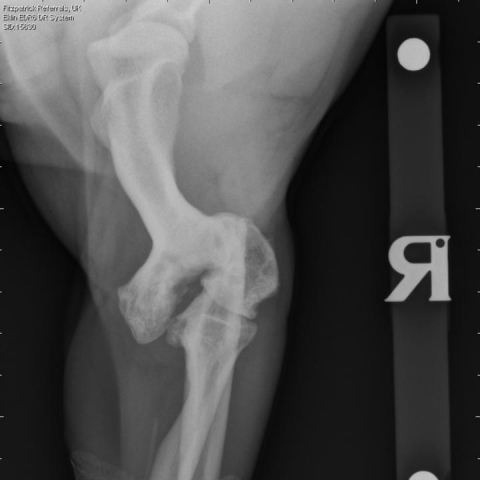 During Bacus’s work-up, which was made of up of radiography and CT imaging, it was clear that reconstructing Bacus’s elbow would carry with it a high chance of failure. 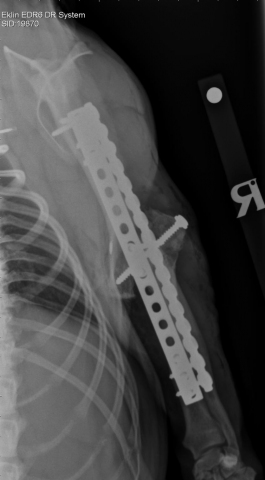 We therefore decided to fuse his elbow in a weight bearing position with the hope he would be able to retain some pain-free function in his limb. The surgery, called an arthrodesis, involves removing any remaining cartilage from the surface of the bones in the elbow, packing it with bone graft taken from Bacus’s shoulder joint and then holding everything in position with metal implants until the bones of the elbow fuse together. Bacus being taught how to use his leg again. Bacus’s surgery was successful and the elbow healed well however the function of the operated leg was not progressing as we hoped and it was at this point that we applied an unusual rehabilitation technique! A quick, and slightly embarrassing trip, to the shops and we had Bacus’s cutting edge rehabilitation equipment ready to go – TIGHTS! The tights helped us pull Bacus’s shoulder joint forward while he was walking and allowed him to learn how to use his leg effectively. 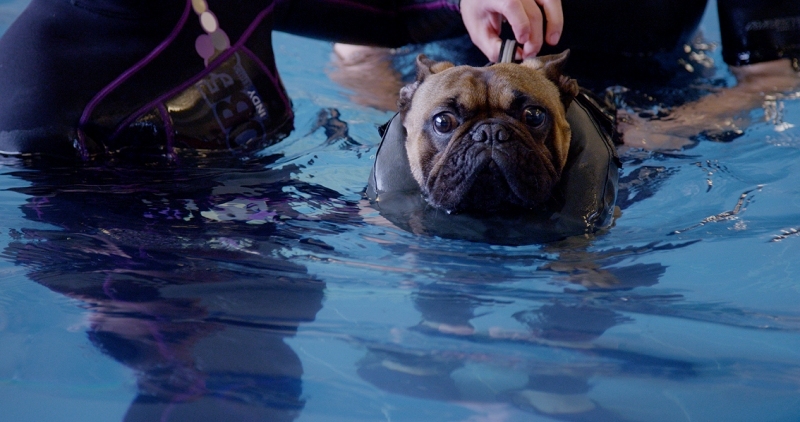 Bacus also underwent a rigorous physiotherapy and hydrotherapy routine to help strengthen the muscles of his shoulder joint. Within a weekBacus was begin to use his operated leg properly and from then on there was no holding him back. 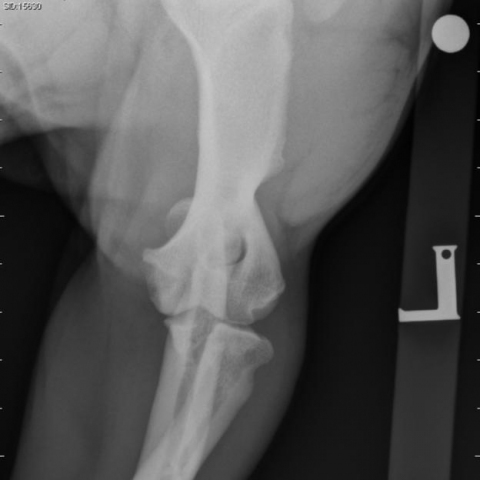 Bacus’s abnormal right elbow (malunion).